We are back on Standard Time and quickly approaching the end of the year. It’s time to wrap up our 2013 business and get ready to start all over again. The year is not going away quietly. Whitman’s Baltimore show runs this week along with an interesting auction by Stacks Bowers. Speaking of Stacks Bowers, we will be holding a joint event with them from Nov. 20-22 where they will offer free grading by PCGS. You can learn more about this on their website. This week is the first installment of ‘Ask Don.’ Check out the video below and send your questions to [email protected], subject line Ask Don. We will do our best to air your question. How Many PCGS Graded Coins Do You Own? 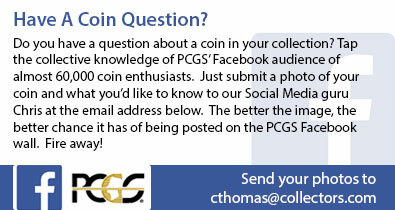 Participate in the PCGS Newsletter Survey and you could win a 1991-95-P 50C PCGS BU valued at $25.00. Please provide feedback on the eCollector and our survey – we’d love to hear from you. 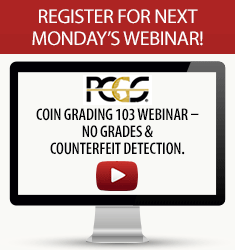 Submit your coins directly to PCGS for grading and authentication at any of the following shows. Everybody wants to get more money for their coins when it comes time to sell. PCGS Pricing Expert Jaime Hernandez delves into the top nine ways to make sure you don’t leave any money on the table during your next transaction. Some of the most interesting American coins are those issued by the colonies prior to the ratification of the U.S. Constitution in 1789. Included among U.S. Colonial coins are Hogge Money, Pine Tree, Oak Tree, and Willow Tree silver coins, the Brasher “Doubloon”, Elephant Tokens, and many more private and legally sanctioned coins. Among my favorites are the Vermont Copper coins issued between 1785 and 1788. The Vermont coinage started out in 1785 while Vermont was still a Republic (it became the 14th American colony in 1777 and the 14th American State in 1791). The first coins bore an image of the Green Mountains with the sun rising behind, and a plow below. View Coin Here The reverse features an all-seeing eye within rays of glory, similar to the design on the Nova Constellatio copper coins. The Latin legend reads QUARTA DECIMA STELLA, which translates to “14th Star”, indicating its place among the American colonies. Another edition combines a Bust type Vermont obverse with a 1785 Immune Columbia reverse – a most unusual combination that may have been made later than 1785. One of the more interesting varieties is the 1786 “Baby Head”, on which the ribbons of the wreath are place so low that they appear to be tying a baby’s bib instead. The 1787 BRITANNIA reverse was an attempt to mimic British copper coins in an attempt to ensure acceptance of the coins in regular circulation, where British coins were plentiful. There are forty different die varieties in the Vermont Copper series, one of which is a contemporary counterfeit and another that is of questionable authenticity. Many of the varieties are extremely rare, so the prospects of completing a set of all of the die varieties are slim, indeed. Also, Vermont Copper circulated heavily, so finding high-grade examples on decent planchets is quite difficult. However, if you are looking for a real numismatic challenge, you will find it here in the coinage of Vermont. PCGS Customer Service Manager David Talk reviews the changes to the PCGS FAQ Page on PCGS.com and goes over some of the top questions that customers ask.